These are 19 of the best bike rides in Canada you can do in a day….or two. If you’re someone who loves a good bike ride but hates biking on roads then I think you’d love any of these bike paths. They all travel on dedicated trails and while you may have to cross the occasional road you won’t have to worry about big trucks flattening you into a human pancake. Most of these bike rides can be done in a day. Those that are longer offer the option of an excellent out and back bike ride. The Lochside Trail is a 29 kilometre multi-use trail that started off as a railway line. It connects the ferry terminal in Swartz Bay to the 55 kilometre Galloping Goose Trail that starts in Victoria and finishes in the Sooke area. It also gets you into downtown Victoria. Enjoy cycling past farms, through forests with towering Douglas fir trees, over trestles and through sections of the city of Victoria. It’s actually a lot of fun if you do an out and back on both trails, spending a night in Sooke. You can read about that trip here. This is one of my favourite bike rides to do in Vancouver. Start downtown in Stanley Park and do the loop around on the seawall. Continue along Beach Avenue, over the Burrard Bridge (with its dedicated bike lanes) and continue to Spanish Banks at the University of British Columbia. There will be times you’re on the road but it’s never for very long. You can make the outing as short or as long as you wish as it’s an out and back ride except for Stanley Park. 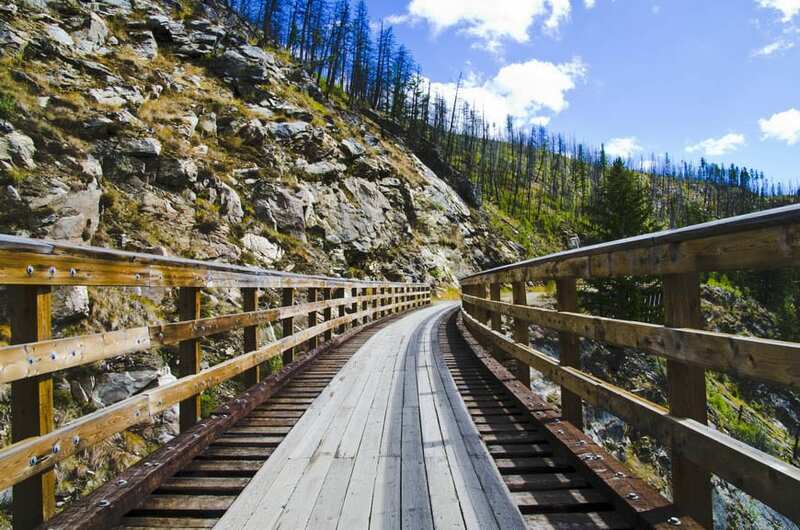 While there are 600 kilometres of trail to cycle you can do a glorious one day section (with the help of a shuttle) from Myra Canyon to Penticton. It’s 80 kilometres long – but it’s all downhill at a grade of about 1.5 – 2%. You’ll get a chance to ride over 18 trestles and through two tunnels – along with plenty of excellent Lake Okanagan views. This is Canada’s newest bike trail which opened in late September 2018. It travels from Kelowna to Vernon past Wood Lake and the especially scenic Kalamalka Lake. The trail is 48.5 kilometres long with a maximum grade of just 1.3%. 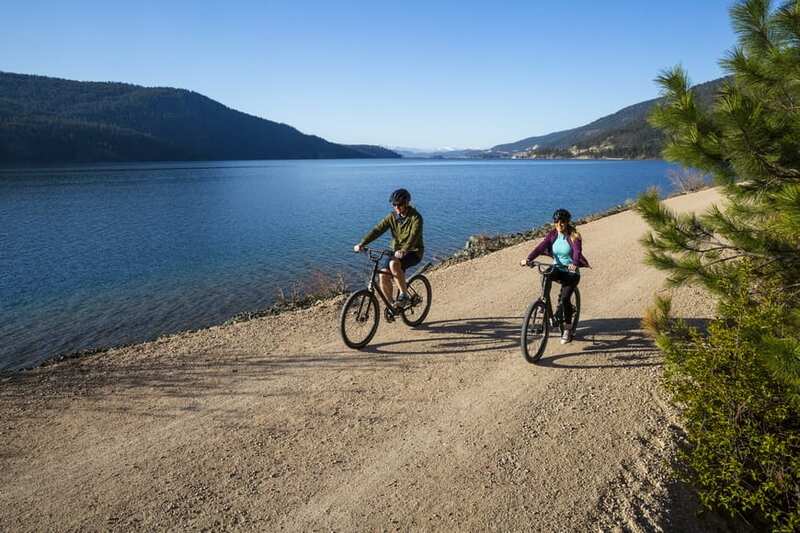 For more information about the trail visit Okanagan Rail Trail. The Legacy Trail, built in 2010 to commemorate the 125th anniversary of Parks Canada is 26 kilometres long and a very comfortable three metres wide. Start on the outskirts of Canmore (there’s a great big parking lot and once on the trail all the tools you need to make any small adjustments to your bike) and cycle into Banff continuing if desired along Vermilion Lakes Drive all the way to the junction with Highway 1A. Although a good part of it is dedicated bike trail, there are sections through the town of Banff that are along the road. In total there is a 185 metre elevation gain (most of it getting to Banff) and a 106 metre elevation loss. Edmonton’s River Valley is the longest and largest stretch of urban parkland in North America. At 22 times the size of Central Park, it’s able to provide more than 150 kilometres of mixed use trails on both sides of the North Saskatchewan River. The trails provide accessibility east and west contiguous through all of Edmonton. Pick up a trail map, rent a bike from River Valley Adventure and go explore for a day. Calgary is blessed to have approximately 900 kilometres (no typo here folks) of bike trails. Since Calgary is my home town I have a few favourite rides. I highly recommend picking up the bike path along the Bow River in downtown Calgary and heading east towards the Elbow River. Follow the Elbow River trails south to reach the Glenmore Reservoir. Do a loop around the reservoir (with construction on the Glenmore Dam there are a few quiet kilometres of roads you have to cycle) and then retrace your steps downtown. You get a great mix of city, neighbourhood and river views, along with a touch of the wild at the west end of Glenmore Reservoir. When you get back to the downtown Bow River section, stop in for coffees and baked goods at the Sidewalk Citizen Cafe and Phil & Sebastian Coffee Roasters in the Simmons Building. For another off-road trail check out the Calgary to Chestermere bike path. If you’re looking for a beautiful section of the Trans-Canada Trail (TCT) to cycle, visit Glenbow Ranch Provincial Park, an oasis of rolling green hills on the banks of the Bow River, a short drive away from Calgary. The TCT trail is completed in Glenbow Ranch, and there is a plan to connect Cochrane to Calgary with the only thing missing – a small strip of land near the Calgary city limits. 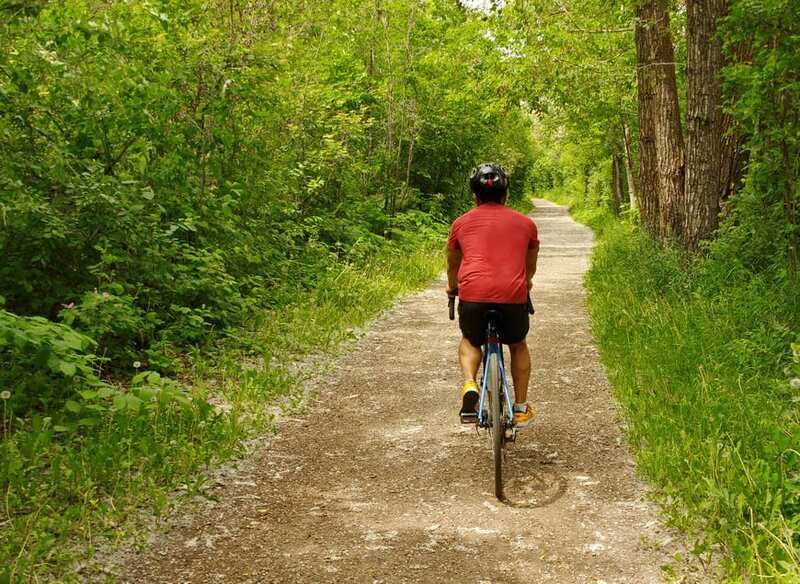 Allow at least half a day to explore more than 30 kilometres of bike-friendly trails. Opened in 2010, the paved 28 kilometre North Star Trail links the cities of Cranbrook and Kimberley. It follows the historic Pacific Railway route through a mix of mountain and pastoral scenery on a gentle grade. It’s part of the route in the annual Kootenay Rockies Gran Fondo. Start in the pretty town of Niagara-on-the-Lake. Cycle past Fort George and pick up the Niagara River Recreation Trail (NRRT) and follow it all the way to Niagara Falls. Pass fruit stands, wineries and some truly beautiful homes. Once you reach the peaceful village of Queenston there are a couple of museums to check out if you want to break up the bike ride. From there you have to climb the Niagara Escarpment – the only major hill on the whole route to reach Niagara Falls. Continue to the falls passing the Butterfly Pavilion and Gardens, the Floral Clock and the Adam Beck Generating Station. Once you get close to Niagara Falls get off your bike and walk it so you can fully enjoy the power of the falls. You can make this into a bigger ride – continuing to Fort Erie and even doing a loop ride – though after Fort Erie much of the biking is on roads. For more information read The Niagara Area Bike Guide. Ottawa is a fantastic city for biking with over 600 kilometres of trails and the famous Nokia Sunday BikeDays, where they close more than 50 kilometres of roads in the heart of Ottawa and Gatineau Park from the May long weekend until the beginning of September. Ottawa was way ahead of their time, offering a shorter version of this when I grew up in Ottawa in the ’70’s. If you visit Ottawa plan to explore it by bike. One of my favourite rides is the out and back 13 kilometre section along the Rideau Canal. Start near the Fairmont Chateau Laurier and cycle as far as Hogsback Falls, about a kilometre past the Hartwell Locks. Along the way enjoy the sight of people kayaking and stand -up paddle-boarding on the Rideau Canal. While the full Blueberry Route, takes you 256 kilometres around Lac Saint-Jean, a massive lake located a few hundred kilometres north of Quebec City, there are certainly opportunities to cycle a shorter section of the route, though granted it would need to be an out and back ride. The route takes its name from the blueberries that grow wild in places thanks to ideal growing conditions provided by a huge forest fire that happened decades ago. It’s part of Quebec’s extensive Green Route. Highlights along the Blueberry Route include rolling farmland with fields of bright yellow canola, spectacular waterfalls, and numerous small villages dominated by beautiful churches. Lac Saint-Jean isn’t always in sight but it’s never far away. A perfect one day section would be an out and back through Taillon National Park with its beautiful lakeside trails and sandy beaches. Once a railway line and now a linear park, the 232 kilometre Le Petit Train du Nord travels between between Mount-Laurier in the north and Bois-des-Filion in the south, though cyclists usually finish in Saint-Jérôme. While most people do the full trail over three to four days, it would be easy to bite off sections of the trail and do it as and out and back day trip. The mostly flat trail is well-marked with kilometre signs along its entire length. The trail caters to the cyclist – offering shuttles, baggage transfer and lots of infrastructure along the route including beautifully renovated, historic train stations. For more information about the packages offered on the route visit autobuslepetittraindunord. As the oldest bike path in Montreal, the roughly 14 kilometre long Lachine Canal bike path travels from Montreal’s Old Port to Lac Saint-Louis along a trail that is paved and mostly flat. The route offers a bit of everything including inner city neighbourhoods, industrial sites, a national historic site, a park and a waterway divided by five locks, similar to what you might see if you biked along the Rideau Canal in Ottawa. For a complete description read this post. Located in Levi, Quebec the Parcour des Anses travels for 15 kilometres along an old railway line along the south shore of the St. Lawrence River. On this dedicated multi-use path enjoy stunning views of the Quebec fortifications, the Château Frontenac and the Île d’Orléans. The Petit Témis Linear Park, a 134 kilometre packed gravel trail between Rivière du Loup, Quebec and Edmunston, New Brunswick offers the cyclist a chance to explore the region over one or more days. The Quebec portion of the trail is part of the famed Green Route. The trail parallels Lake Témiscouata in Quebec and then the Madawaska River from Dégells all the way to Edmunston. There are services along the trail including bike rentals, luggage transfers and camping. The 92 kilometre Celtic Shores Coastal Trail links Port Hastings with Inverness on the west side of Cape Breton Island via five community trails. The first kiosk on the trail is accessible just after you cross the Canso Causeway into Cape Breton. Much of the scenic trail follows the coast past fishing harbours and even a warm-water beach in Port Hood. Many people turn it into a multi-day trip as there are plenty of worthwhile stops along the trail. Check out Mabou and Inverness along with places “where you’ll find the best live Celtic music – hands down” according the Celtic Shores website. For a map and a good route description click here. If you like your biking easy and hate cycling near a car check out the Confederation Trail in PEI. You can do a tip to tip ride along the length of PEI and in theory if you’re a strong rider you could do it in one long day. I’d recommend mixing it up a bit and exploring the quiet back roads as well. There are lots of tour companies that run multi-day tours along the Confederation Trail – stopping at great inns and fantastic restaurants. Visit this page on the PEI Tourism website for a link to a downloadable map. If you want to see some of the best scenery Prince Edward Island has to offer, hop on a bike and cycle the Gulf Shore Parkway in Prince Edward Island National Park. The trail winds between Oceanview Lookoff in Cavendish and North Rustico Beach. Stop and swim in one of the six beaches you’ll pass, enjoy the dunes at Brackley and get your Instagram photo at the Covehead Lighthouse.